There are many free business themes that promise a lot of features and functionality, but not all free themes are created equal. Some may look beautiful but not be flexible enough to adjust to your needs, and some may have a bunch of features but lack good visuals. Sifting through these free business themes can be a herculean task! We’ve compiled some of the very best free business themes, that boast not only good design layouts but also great functionality and flexibility, great support, and are regularly updated to address bugs and add new features. Building a website for your business is not as hard as it used to be. If you have limited time or budget, using a pre built theme to jump start your website is the best way to go. And instead of investing in a premium theme that may or may not work out for your needs, starting off with a reputable, well maintained and well supported free theme can be a better option. This way, you can test drive the theme, communicate with the developers if any confusion arises, and if everything looks good, even upgrade to a paid version of the theme (if available) to get more features and support options. 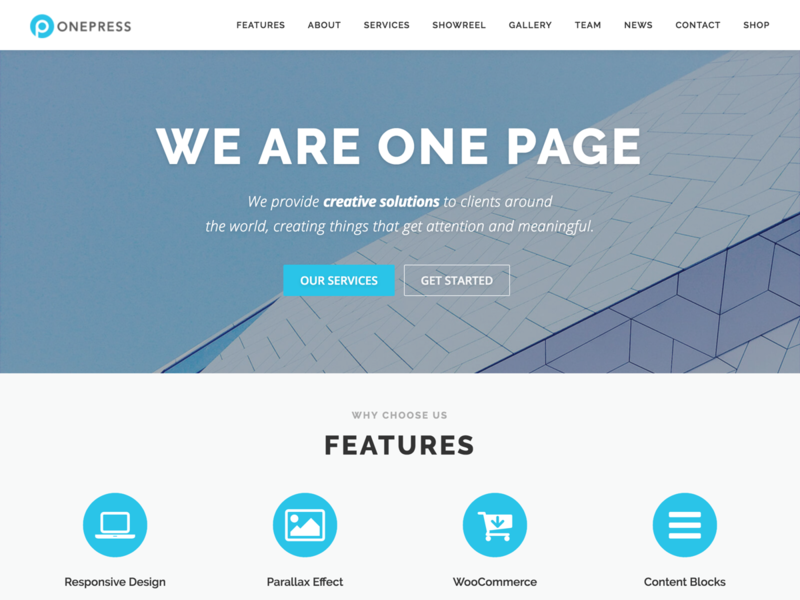 All these free business themes require a self-hosted WordPress site. 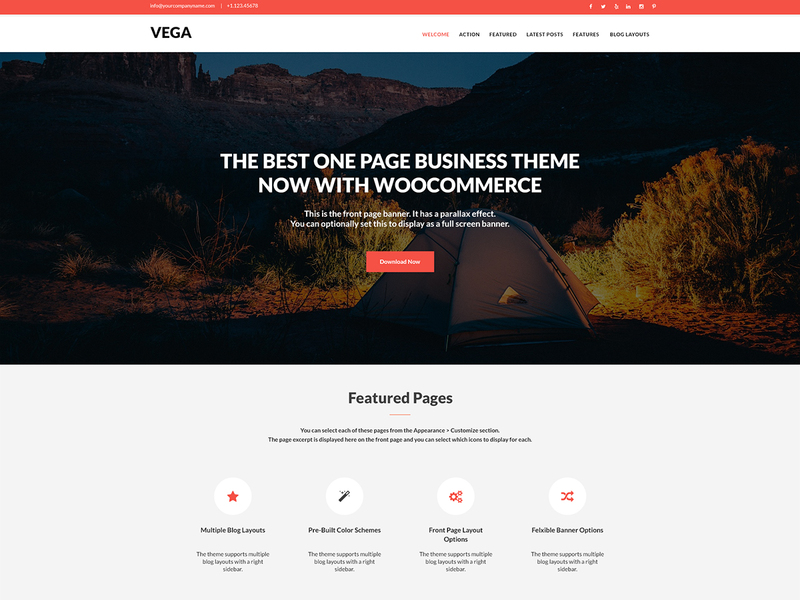 Vega is a well established, highly rated, well supported and maintained free business WordPress theme that is extremely flexible and easy to use. With 20+ five star reviews, Vega is backed by LyraTheme’s promise for dedicated and honest one on one support. The theme comes with three pre-built color schemes (blue, green, and orange) and has multiple home page banner options. The banners for internal pages are also highly flexible, where you can choose to show the header image across the website or use the featured image as the banner if needed. 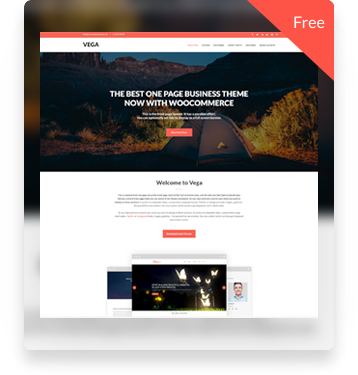 The theme supports multiple blog formats, multiple footer widgets, and is WooCommerce ready. There is a top bar that houses an extra smaller navigation and social media icons as well. The one page home page displays the banner, welcome content, featured pages, two call to action rows with an optional parallax background effect, recent posts, and an open content row. Vega was designed and developed keeping in mind the basic needs of a business website, and presents its functionality in a way that even the most novice of WordPress users are comfortable using it. This is one of the very few free business themes that exceeds users expectations when it comes to functionality and design. Sirius is a clean, crisp, and beautiful material design WordPress theme that is flexible, feature filled, responsive, and easy to setup and customize. Sirius was design and developed keeping in mind the needs of a small business website. 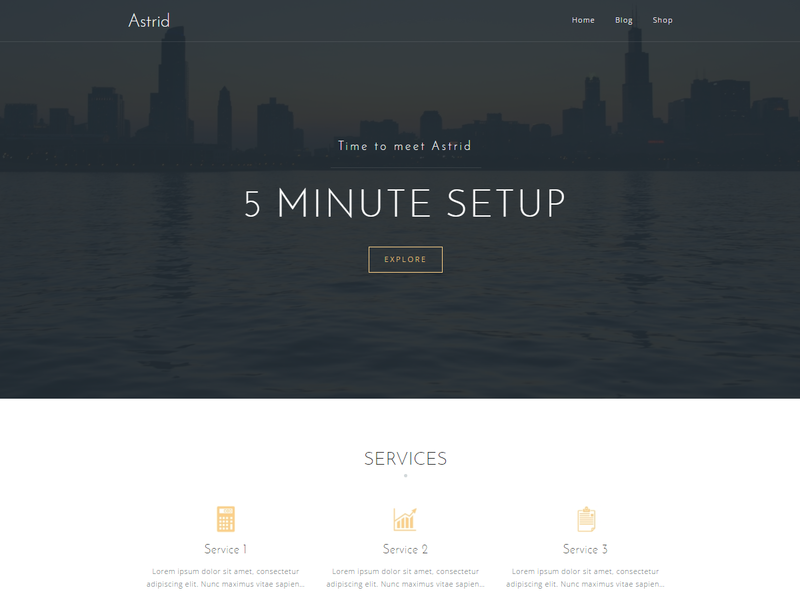 It provides an intuitive interface and all the right pieces that are needed in a business website, so getting started with this theme to set up a unique and professional looking website for your business will be quick and easy. This free material design business theme is professionally designed to adhere to Material Design guidelines and has been developed using the Bootstrap framework making it highly extensible and accessible on devices of all sizes. Sirius is a bloat-free, no non-sense, professionally designed and meticulously coded business theme that is also unarguably the best free Material Design theme in the market today. The front page is built so that you can optionally set it up as a one page scrolling page. Beautiful typography, multiple front page sections, and open content sections with the flexibility to load any content provide a powerful and flexible interface to craft a website that is not only unique, but also professional looking, highly engaging, modern, and sophisticated. 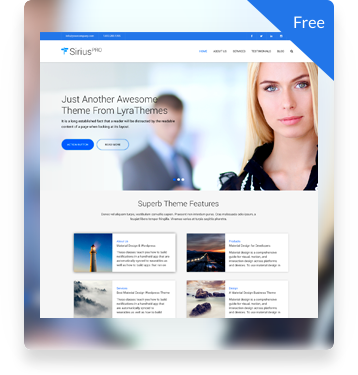 Sirius is different from most free business themes not only because of its professional design, but also because of its many “premium” features that help set your website apart from the rest. 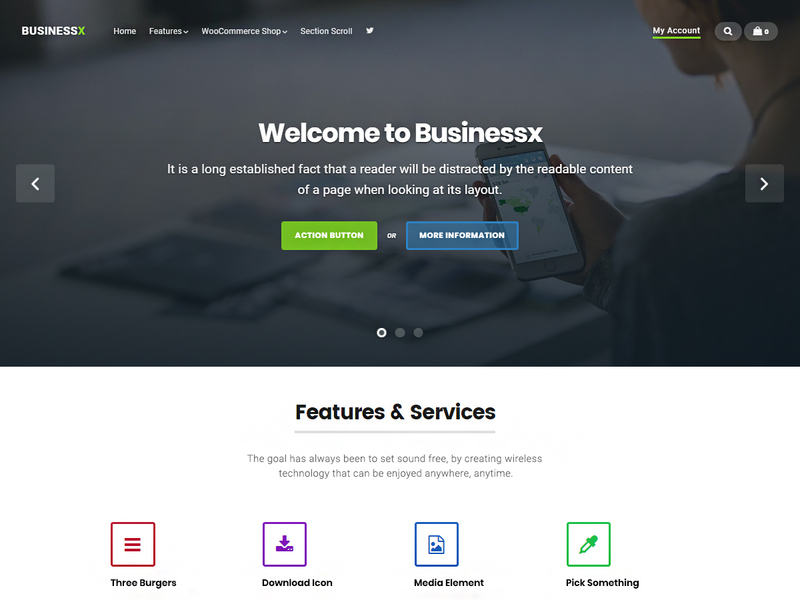 Businessx is a free one page WordPress business theme. It has a very solid design and tons of features that can be used to create a unique and professional looking business website. Up to 12 home page sections, including a slider, about us section, team, clients, portfolio, call to action, and much more, provide you ample options to set up a stunning front page. It comes integrated with WooCommerce so you can start selling right away. Businessx has two menu styles, transparent and colored. You also have the option to make the menu sticky, making it hide and show each time you scroll down. Businessx comes with unlimited color schemes, thus giving you complete control over the look and feel of your website. The extensive documentation and videos will help you get started and use the theme to the best of its potential. 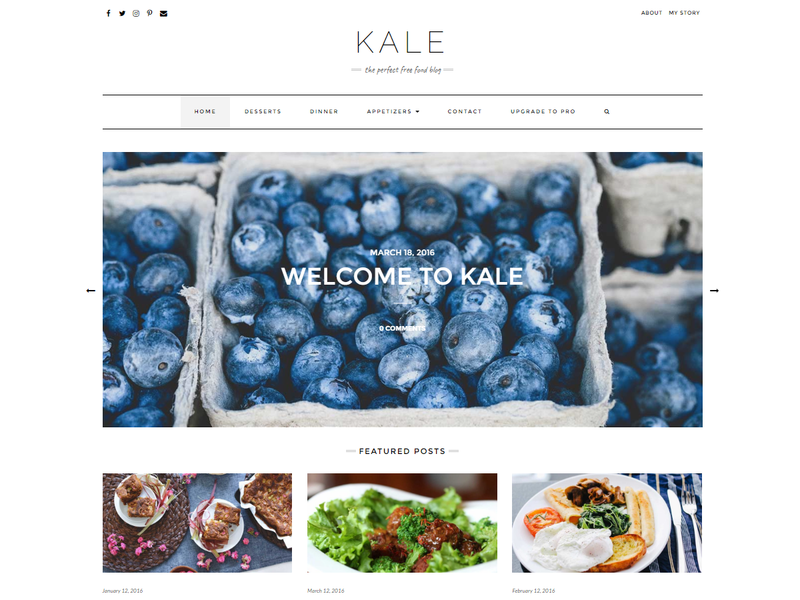 Kale is your go to theme if your business has anything to do with food; cafes, restaurants, pubs, bakeries. Going for more of a blog format may work out to keep your users engaged and interested in your new offerings. Even if you do not regularly post new recipes or articles, this theme helps keep things fresh by providing a great display for all of your great photos and services. 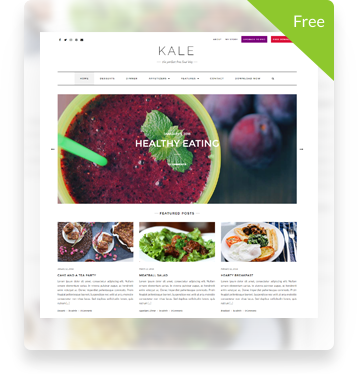 Extremely clean and minimal, yet polished and charming, Kale will surprise you with its flexibility and ease of set up. The home page gives you the option to use a slider or a banner. The front page has a spot for featured posts that you can choose easily from your Customize area. A unique feature of this theme is the highlight post where you can select a post to be shown as a large highlighted post right after the blog feed on the front page. The sidebar is versatile and flexible, with the ability to showcase your latest posts, some information about you and your business, and much more. Kale’s no non-sense aesthetic exudes confidence and professionalism, all the while representing you and your brand in the most effortless of ways. Spacious is an incredibly flexible multipurpose responsive theme that can be used to create a beautiful professional looking business site in just few minutes. This free business theme comes with more than 5 custom widgets, and 12 widget areas thus giving you a lot of flexibility in crafting the perfect website. Spacious is WooCommerce ready so you can begin selling your products and services right away. Along with the option to choose a boxed or wide layout, Spacious also gives you an awesome slider and dark and light skins so you can take your website to the next level. 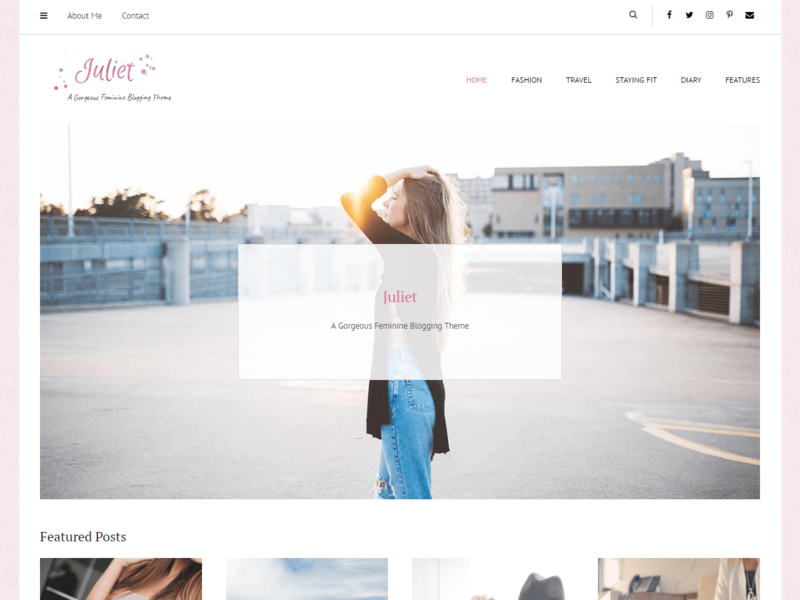 Choose Spacious for your business, portfolio, blogging or any creative website to experience one of the best free WordPress business themes in the market today. Juliet is a beautiful, highly flexible, warm and engaging theme that looks great on devices of all sizes. Suitable for a wedding related business, flower shop, lifestyle blogger, event manager, Juliet comes with many customization options, great typography and a gorgeous design. An off canvas area allows you to house some additional items like a brief description of your business, and current promotions. With multiple page layouts and blog feed formats, Juliet is well equipped to take your business website to the next level. 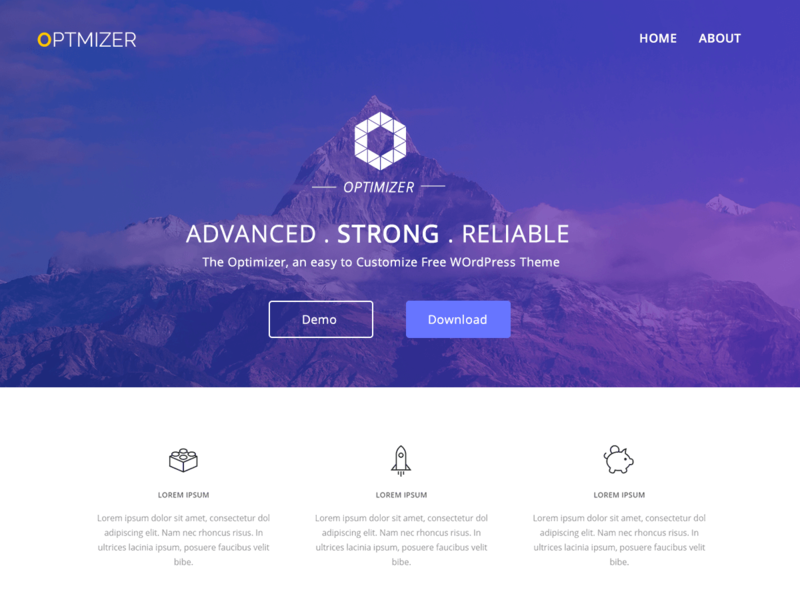 Based on the Bootstrap framework, the theme is highly extensible and flexible and looks great on all screens. 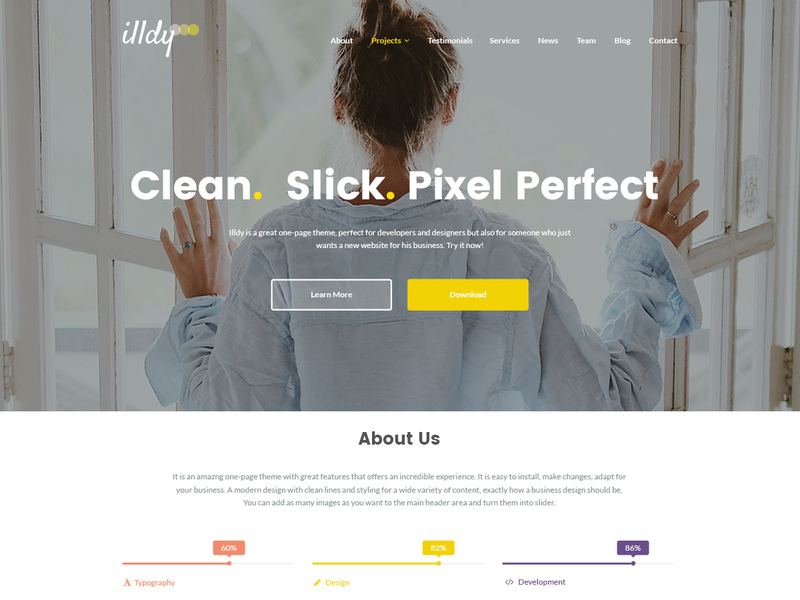 Illdy is a multipurpose WordPress theme built on the Bootstrap framework making it fully responsive and mobile friendly. The theme is suitable for businesses, landing pages, and any other creative websites. It also supports a one page setup with multiple sections that can be used to create a unique and beautiful website. Illdy has dozens of options for additional customization, such as full control over footer copyright text, colors, hero images, etc. It comes with WooCommerce integration and is translation ready. 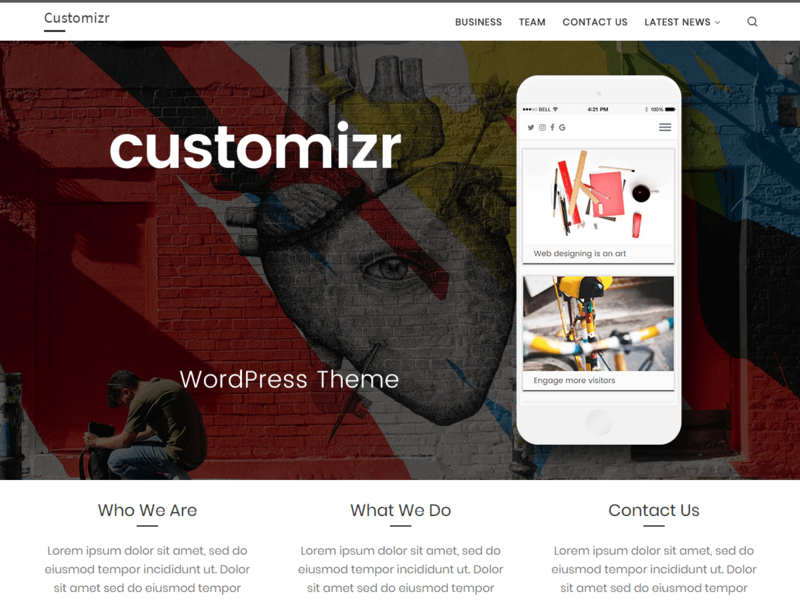 This theme comes with all the sections you may need for your basic business website all backed with some great customization options and awesome customer support.